Congrats to all Marine Corps Marathon finishers and other runners who race this weekend! Now that marathon training is done, it’s time to step aside from Marathon Monday for a while. 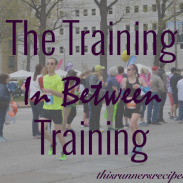 I loved doing all those posts on what I learned about marathon training! Over the next several weeks I will focus my training on base building. What exactly is base building? I discuss it in-depth in this post of mine from earlier this year; Lisa at Running Out of Wine also provides an excellent breakdown of base building in her post here. 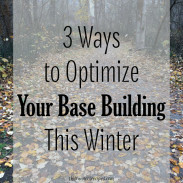 In short, base building is a meso-cycle in training in which you run lots of easy miles in order to develop a mileage base for more specific race training. My next race is the Lake Sammamish Half Marathon in March (although there’s a local half marathon on my favorite trail in January that’s tempting me as well). Training for the Lake Sammamish Half will begin in mid-December, until then, all of my miles will be kept within my easy range (which is easier said than done). Since, however, I’m not running high mileage, my easy miles can be paced a bit higher on the easy scale. Based on my half marathon PR on April and my marathon training paces (not the marathon itself, since I had stomach issues during that race and ran a slower time), my easy range is from 8:15-9:45, so that’s what I’m aiming for during my runs. However, I am not running by pace, but rather by effort; I’m wearing my Garmin to track distance and see my splits later, but I’m letting perceived effort be my guide. My runs this week have all been at the faster end of the easy pace range. Since I’m not running high mileage or doing any speed work, I can let my easy runs be faster than when I was running 55-60 miles per week with 2-3 demanding workouts. Honestly, after months of prescribed paces for each and every run, I find such enjoyment and serenity in just running to run, whether it’s an 8 minute mile or a 9 minute mile. Monday: 5 miles easy on the treadmill, 8:30/mile, 1-2% incline, followed by MYRTLs and planks. I usually drive 15-30 minutes to run, depending on the traffic, and on Mondays I usually find myself choosing the treadmill just so I don’t have to drive. Lazy, right? Ryan launched Brew Pup on Monday night and we’ve already made several sales! I am ineffably proud of him for how much time and effort he has devoted to this business and to helping rescue dogs across the country. As of now, Brew Pup is partnered with four dog rescues across the country. If you know of a rescue that would be interested in partnering with us, please let us know! Also, I’m super excited that we’re getting our own samples to try, because I can never have enough cute sweatshirts. Tuesday: AM: 7 miles easy, 8:29/mile. PM: 15 minutes strength training. 7-8 miles is my sweet spot for running, so it felt good to finally run that far again after taking it so easy for marathon recovery. 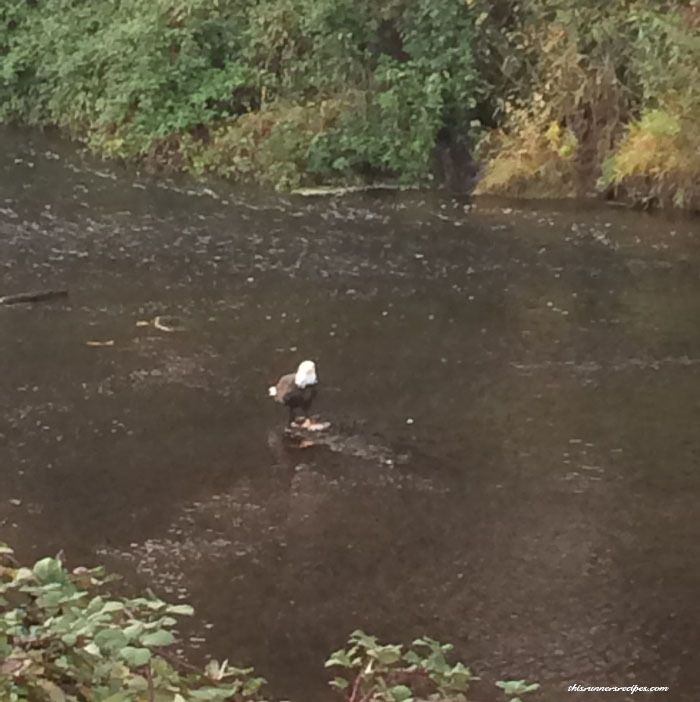 This run was only made better by the fact that I saw a bald eagle sitting on a rock in the middle of the Sammamish River. I could not resist stopping for a couple minutes to take pictures and just admire it. I had a GI doctor appointment in the afternoon, and by the time we got home from that, I just did not want to workout, so I did one round of this strength training workout and called it a day. Wednesday: 5 miles easy, 8:30/mile. Seemingly out of nowhere, sunrise is not until 7:30 here! Even when the sun does rise, a thick blanket of fog has covered parts of the Eastside of Seattle (and I’m sure Seattle proper as well). I literally entered a thick layer of fog halfway through this run where I could only see a few feet in front of me! Of course, just as I’m weird and love the overcast PNW weather, I oddly enjoyed this as it was so serene and almost ethereal. Thursday: 5 miles easy, 8:52/mile, 0.5-4% incline, and 20 minutes strength training. I did this strength training workout from Eat Spin Run Repeat and really enjoyed the variety it added to my routine. A long time has passed since I last did burpees and those burned a bit! In the evening I got to meet up with Lauren from Just a Pinch and Amanda from Slimpify Life (if you don’t already, you should read their blogs!). We grabbed juice at Evolution Juice in University Village and chatted about nutrition, blogging, major career changes, and hiking. They were both so friendly and I had so much fun getting to spend time in person with them! Friday: AM: 8 miles easy, 8:13/mile, followed by foam rolling. Friday’s run was fantastic. It was 45 degrees, which is the temperature where I really feel I can just let my legs fly. It’s rather obvious that I’m a Midwest transplant: I’m out there running in shorts and a long sleeve shirt while other runners are bundled up in leggings and running jackets and vests. I adore this weather, and even more so I love the fact that most of the next few months will have this weather. After my run, I settled in to take my Road Runners Club of American coaching exam. I passed with a 97%! I hope to launch my online coaching business at the end of the month, which will offer customized training plans and various tiers of personalized online coaching. All students will receive a 10% discount on all services, and keep an eye out for an upcoming giveaway! Saturday: Hiking, 4.5 miles, with a 25 lb backpack. 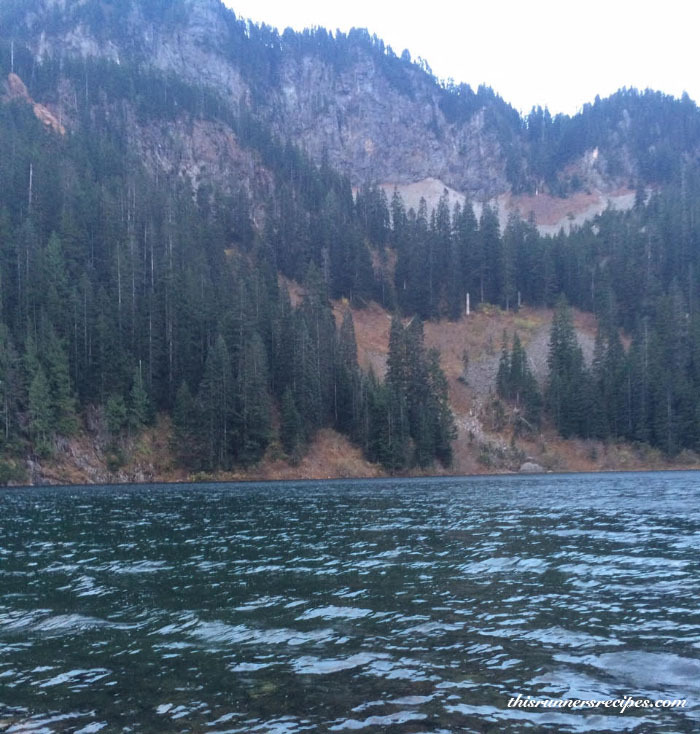 More on our camping trip at Annette Lake later in the week! The heavier backpack did make the climbs a bit more of a challenge. My endurance may be strong, but I need to work on my strength, especially as we extend our hikes and get further into backpacking. After the 3.5 mile hike up, we hiked around the lake some more and let Charlie play in the water a bit. Sunday: Hiking, 3.5 miles, with a 25 lb backpack. And then we hit up Starbucks, made pancakes at home, and promptly crashed on the sofa. Add Pilates back into my routine. I used the same Gaiam videos on and off for 10 years and I finally need to switch it up from them – does anyone have any good suggestions for Pilates online videos/workouts? How was your training this week? Did you race? Any recommendations for online Pilates workouts? Wow, props to you for hiking Annette Lake with a 25 lb backpack! I’ve been thinking about signing up for an early spring 1/2 marathon, but i’m still trying to decide which one. Maybe I’ll look in to the Lake Sammamish Half! 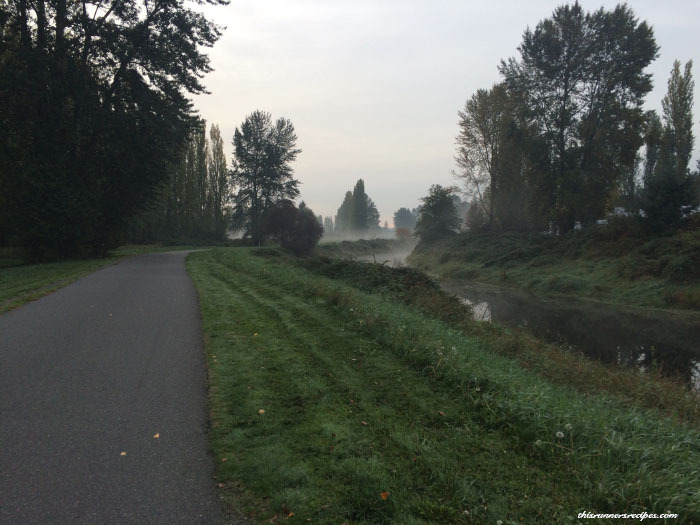 You should run the Lake Sammamish Half! The lake is beautiful and it’s a flat course on a multi-use path, and I think the prices are still discounted. It’s the first weekend in March. And thank you – admittedly, having a good backpack with waist and chest straps helped immensely! I tell you what, I am struggling a little bit to get back to doing all the other things that I know I should be doing (other than running, I mean). I always have this problem after a marathon. I let my other pursuits fall a little bit to the wayside during those last few weeks, and now I don’t want to start them up again! Most people have the opposite problem, haha. That’s how I feel with Pilates/yoga right now! It’s hard to get that ball rolling again, but you’ll get back into it soon! 🙂 Marathon recovery is all about taking it easy and listening to our bodies, right? Its great to read about how you’re structuring your workouts post-marathon. 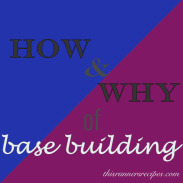 Its also great to read how someone else approaches base building! I definitely agree about the enjoyment after a training cycle in just getting out there and running by effort. Enjoy every mile! Thank you! I loved your post this morning about just enjoying running – fall running is so beautiful that it’s nice to just get out, enjoy the run, meditate/pray, and not worry about pace. Yay for base building! I admire your ability to be so dedicated to your base building. I have such a hard time staying motivated to run a lot in the off season. I guess I just get so sick of the high volume and the feeling of needing to run during marathon training that I want to avoid that as much as possible when I’m not training for a marathon, even if I know it will help me later on. Even now as I’m half marathon training, I’m finding it hard to do more than the bare minimum every week – I want to have a more balanced life while I still can, before training takes over my life again in a couple months. It was gorgeous but so windy! And thank you! I do find it much easier to focus on building up mileage and keeping the motivation to run when I just cut out all hard efforts (except for long runs, which I hope to add back in soon). It’s the motivation for those hard workouts that takes a lot out of me! I always set a range as well (like, 25-30 miles or 40-45), so that way I can go by what my body feels. Marathon training does have that tendency to feel all-consuming, so it’s nice to break away from it! I think you should do the January half marathon too! Optimize your marathon training fitness earlier than later and go rip that half apart!!!! I’m soooo tempted to do it – I really want to get to know the local race scene and connect with runners to grow my coaching business as well! Plus the race is themed for the rainy season and they give all finishers an umbrella – how cute is that?! I would definitely be tempted by a race on my favorite trail…decisions decisions 🙂 I’m looking forward to reading more about Brew Pup. I volunteer at a shelter and we work with lots of rescues so I might pass on some names to you! Good luck with your goals next week! Thank you! We would love to get the names of good shelters – that’s so cool that you volunteer at a shelter! With views like that, I would never be on the treadmill! If it wasn’t for the traffic on the commute, I never would! It can be tough to get into the other things after training for a marathon. After my marathon last fall I went back to body pump and was SO sore. It’s easier to stick with our routines, but its so important to change things up! I can imagine – BodyPump always leaves me sore! 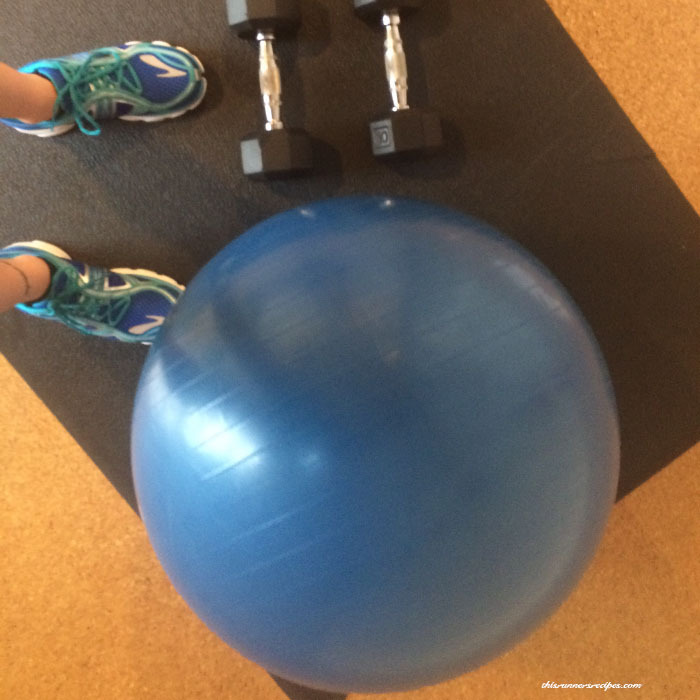 It is so good to change it up – and the change in routine makes new workouts feel exciting! Can I come hiking with you?!?!?! Yes, do come! 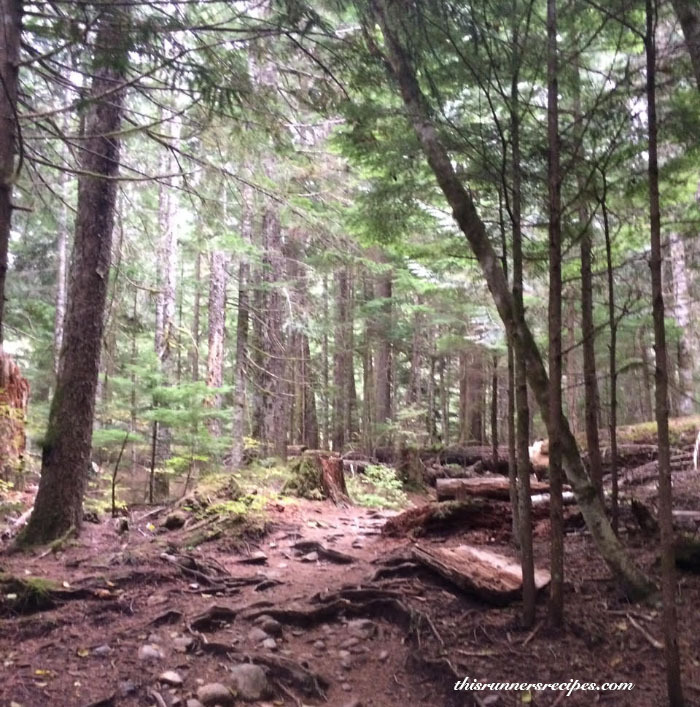 There are an endless number of hikes out here! It’s been really dark here in the morning too! I’m with you on 7-8 being my running sweet spot – less and I don’t feel like I warm up and more can be intimidating beforehand! I’m so ready for the time change to bring light to the mornings!